A Healthy Summer Fruit Tart is a nutrient dense food full of fiber, vitamins, minerals, flavanoids, antioxidants, and protein, with high amounts of life force from fresh ripe, organic ingredients, and without what’s bad for you–white sugar, artificial stuff, preservatives, things with no life force, like frozen fruit and pie crusts off the shelf of Cost Co. Traveling in Europe one of the things you might notice is that the pastries are sweet, but not sickeningly so. 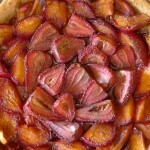 In particular the fruit tarts are slightly sweet, but not so much that the flavor of the fruit comes second. Something I learned years ago from the Macrobiotic tradition is that you can make a desert using healthful ingredients that is mildly, not sickeningly, sweet. One of my teachers used to say “sugar is poison.” It’s a dramatic statement, but undeniably true; we know it from science. A human being today can eat in a single day all the sugar our biological ancestors ate in a year. Diabetes rates are off the charts. The key to making delicious fruit tarts or pie is the quality of the ingredients. Use fruit that is in season. The peak of the season for berries and stone fruits in San Diego, California is late June through July. You can make a fruit pie or tart with frozen blueberries grown on the moon if you want, but nothing approaches the flavor of a pie made with fresh fruit in season, fruit that’s hard to keep from devouring the minute you get them home. When you use dense, intensely flavored in season fruit for your pie, you really don’t need to add much additional sweetener, because the natural sugars in the fruits are there. And if you add spices that go well with fruit, like saffron, cinnamon, cardamom, nutmeg or clove, and also use nuts and seeds in your crust, like ground almond, walnut, pumpkin seed, and apricot kernal, then there is so much flavor you don’t need to dumb down your pie with white sugar, because your olfactory sensors and taste buds are stimulated by a riot of fabulous flavors and notes. Sunday my friend Anna gave me a bunch of peaches from her friend Ian’s tree; not the bloated pasty things you find in market all too often, but small, sweet, dark orange fruit, what in India would be called “country peaches.” The same day I had been to City Farmer’s Nursery over on Home Ave. in San Diego, and picked up some eggs and strawberries the lady there had gathered and picked the same day— deep orange egg yolks, hard shells you really have to crack, dark, ruby red strawberries, bursting with fragrance and a dense juicy texture. Now came Tuesday, and my house was out of bread and full of fruit, so I decided on a fruit tart. I like to make tarts based on the tarts I used to get from Hermann, the German baker at Chez Odette, the Belgian cafe that was for years on Fifth Ave in Hillcrest. Odette the chef, and her husband Hermann, the baker, finally just got too old to manage the demands of cooking and catering and retired to Temecula, God bless their memory. But it was at their sweet cafe I first had this kind of fruit tart with a firm, chewy, crust, as close to bread as it is to pastry. Not too rich. All about the fruit. I remember marveling at how wonderful Hermann’s tarts were, and Hermann, a bit of an introvert, laughed, shyly, muttering something humble like, “oh, these are just typical country tarts…we make them in the village.” I think he was Bavarian. 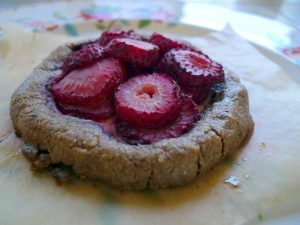 I like to reduce the amount of gluten I eat, so I generally use 1 part Whole Wheat pastry flour with 2 parts Barley flour. Barley, like wheat, is considered cooling in Chinese medicine, so very good in Summer. But, wheat is heavy and damp producing, which means it creates gunk in the works, the word in Chinese translates as “sodden.” This is a function of its higher gluten content. Gluten is like rubber; its what makes bagels and pizza dough chewy, they are made with high gluten wheat flour. This is why there is so much gluten sensitivity; its a hard to digest protein, and people just get too much of it. You don’t need to be “allergic” to gluten to benefit from eating less of it or none at all. Barley on the other hand, is easy to digest, low in gluten, and is a grain that actually is used to drain dampness, which is a way of saying that it helps cleanse the system. And the nice thing about barley is it bakes similar to wheat, not as soft, but similar. For this kind of crust, its perfect. Another option is to use whole grain Spelt flour, which I get at Ocean Beach People’s Food Coop, but you can also to get from Vitacost which has great prices. Spelt is an heirloom non-hybridized relative of wheat, in the same Triticum genus, but a different species. Spelt is much lighter and easier to digest than wheat, and people with wheat sensitivity may find Spelt to be well tolerated without digestive issues. Everything you ever wanted to know about Spelt is here. Sometimes I make a no-flour no-gluten crust, with ground nuts and or seeds. My favorite are almonds, walnuts, pumpkin seeds, apricot kernals, and cashews. Each nut and seed has a different texture and flavor. Walnuts are very soft and moist, as are the apricot kernals; they both give a very rich flavor. Pumpkin seeds impart a lovely color, and almonds are very strong. They are called “nut meats” for a reason. Nuts are full of protein and fat. The nut and seed crusts are wonderfully crunchy and rich, whereas the flour crust is more bready. Since I make little tarts as needed, if i i feel like a need more carbs, I use flour, if I want more fat and protein, I use seeds and nuts. Almonds I buy pre-ground as meal, but the other nuts and seeds I grind as needed in my spice grinder. This is the best “spice and nut grinder” I have found, with a 200 watt motor and all stainless steel inside, no plastic. What Kind of Sugar? I don’t own white sugar. If I am going to sweeten something I use a natural sugar with a lower glycemic index, and I use just a little. My favorite of late is Coconut sugar, high in mineral content, with a buttery almost caramel flavor, and low on the glycemic index. But don’t kid yourself, its still sugar. Be careful. Another I like for pie or tart is date sugar. I love how high quality cinnamon mixes with fruit. Ceylon cinnamon is light and mild, whereas Vietnamese cinnamon is dark and intense. Suit your mood. With strawberries, which are themselves intense and sour, I feel the lighter cinnamon gets lost, so I use the dark one. There is even a special cinnamon used in Chinese medicine to “anchor the yang” called Rou Gui, which I like using in Summer. Cardamom is another spice I like in cooked fruit; compote, pie, torte, jam. Cardamom is excellent with pear, peach, apricot, berries, too, but especially lighter fuit like peach and apricot. Saffron is a natural pairing with cardamom, finding its way into all kinds of Persian, Indian, and Middle Eastern sweets, and I love it in fruit. Bread and Cie, the wonderful french bakery in San Diego 92103, makes great fruit tortes with saffron and pistachio crust. Even better with cardamom. Sometimes I even add orange blossom water or rose water. Nutmeg is another excellent warming spice that protects your digestive fire and helps to digest foods. I like it with apple and pear and nuts especially. Almond extract and vanilla extract are sometimes in my crust, and I learned this year that a little vanilla extract softens the edges of almond extract. Almond extract gives a marzipany flavor to a flour crust without the fat. In Summer we sweat and our yang energy or heat keeps getting dispersed and exhausted. On freezing cold days you feel cold, but on boiling hot days you sweat and become exhausted. In winter in every culture people eat heavy high calorie food, but in summer switch to lighter food. That is in part because our digestive fire weakens in Summer, because the Yang is at the surface. Conversely, in Summer, because it is so hot, we eat lots of cooling juicy food like fruit, and more raw food. Raw food is cooling, because your body has to provide the fire to break down the cellulose that is normally broken down by cooking. So raw food is harder to digest. And we need to drink a lot more in Summer, and the fact is that water is itself cooling. That is why in the desert an oasis is cool. Its not the shade so much as the green shade and prescence of moisture. Which would you rather have in hot weather, and which would be more cooling, a dried apple or peach, or a fresh one? Dried fruit is warming and fresh fruit is cooling. The difference is the presence of water in the one. This is why in India, where you have to drink a lot of water, they often put cumin seed in the water, jeera pani, to protect the digestive fire/Agni from the naturally cooling effect of water. You want to cool the body, but you dont want to chill the digestive fire, this is the paradox. Digestion is a warm process of transformation, and transformation of all kinds requires Agni or Fire, what we call Spleen Qi in Chinese Medicine. In Ayurveda and Chinese Medicine it says that if you weaken Agni/Digestive Fire, or Spleen Qi, especially in Summer, when Yang accumulates, to be dished out in Winter, when Yin accumulates, your will be more prone to colds, flu, and allergy. It is part of the immunity process, preserving the yang/fire, its what makes you strong instead of doughy. Its Yang energy that fights infectious and autoimmune disease. Autoimmune diseases are chaos, and its Yang that makes order. Its easy to “damage” our digestive fire by eating cooling raw food like fruits, salad and beverages in summer. So one of the remedies, is to create balance, by adding fire to water, yang to yin, like adding cumin to water, or adding warming spices to fruit pie, or eating watermelon with a little salt. Hence the cinnamon in this pie, which, conveniently is also an amazing flavor. In fact if you look at the way traditional cultures approach food, its always in tune with nature and an attempt at balance. In the south of France, in Langue d’Oc, across the border from Barcelona, by November the cuisine changes, to heavier fattier dishes, grounding the body and soul for the approach of winter cold. Liquid to make the dough. Sometimes I just use water, and sometimes I use milk or soy milk. Use egg if you want it richer. Sometimes I use kefir or yogurt, which goes especially well with cardamom and saffron, and if your fruit is real sweet adds a little bit of acidity. Coconut milk is also delicious. Please Note: I do not measure anything, but go by eye, so will do my best to imagine the quantities I have used. But know that you may have to adjust. Fruit, sliced, your choice. Good with pear, plum, peach,apricot, berries. Slice the fruit in whatever shape you like, some I cut in half, others in slices. Cinnamon or other spice, to taste. Last tart I used probably 2 tsp dark Vietnamese Cinnamon. I don’t use a rolling pin. I mix the flour, knead it, roll it in my hands into a long thing, fold it over and fold it over in my hands, and its soft enough. You could use a pin, of course, and maybe it will be softer, but the less to clean up the better, as far as I am concerned. Its also fun. Have your child help with this part. Then I place it in a pyrex pie dish in the center, press it down and out and push it until it reaches the end. The I either push the ends up and make a little bund with the edges to keep the fruit in, or I use the end of the dish, like a regular American pie, so the end of the crust flares out. Now layer the fruit onto the crust. I like to make it pretty by alternating face up with face down, or putting face down in the outer circle and face up in the inner, like some kind of pinwheel galaxy of baked fruit. Now sprinkle your cinnamon and sugar on top as evenly as you want. Sometimes I make it uneven so that when you have your pie you get bites without cinnamon and then surprise bites of high intensity. Baking at 365 degrees for about 30 minutes seemed to work well. I may have put it back in for an additional 7 minutes. Again this is a function of how cooked you want your fruit and how dark the crust. Allow it to cool and show off your art to your guests. !